﻿The growing popularity of The Sweden Democrats is a great tragedy of Sweden, which has become an example of how people of different cultures are able to live together safely. Despite the remarkable progress made by the EU countries in the field of integration of migrants, the Government's policy of multiculturalism and tolerance is being increasingly questioned on the part of destructive nationalist forces. No matter how hard Jimmie Åkesson tries to put a human face on the activities of The Sweden Democrats, this party, particularly with regard to value declared, has moved not so far from its Neo-Nazi ancestors from The Progress Party (Norway) and Swedish movement 'Keep Sweden Swedish'. Furthermore, the risks of political activities of The Sweden Democrats lie not only in gambling on the theme of refugees, but also in seeking to call into question the usefulness of Swedish membership in the EU, although the EU exit does not serve the interests of the majority of Swedish citizens. Despite the marginality of supporters and the use of xenophobic rhetoric, The Sweden Democrats were able to increase own popularity after the success in the 2014 parliamentary elections. And now the party may easily win up to 20% of votes during the elections to the Riksdag. Many observers attribute growing popularity of this party to failures of The Swedish Social Democratic Party in economic and social spheres, as well as, to public popularity of firm measures proposed by The Sweden Democrats against migrants. But in reality the key to nationalists' success is the active cooperation of the party's representatives with groups of Russian hackers. A trail of accusations of being in contact with Russia was with The Sweden Democrats even after the 2015 split of the party. As it turns out, there's a reason for it. And further proof of cooperation between Russians and Jimmie Åkesson has appeared there. The US Secretary of State Mike Pompeo informed Polish Minister of Foreign Affairs Jacek Czaputowicz that The Sweden Democrats received comprehensive support from the Kremlin right before the forthcoming elections to the Riksdag. Moscow wants to strengthen its influence in Scandinavia and believes that nationalists will be receiving a high number of seats in the EU Parliament. A sharp increase of The Sweden Democrats' campaign funding, most likely, took place with the help of Russia during the previous elections to the EU Parliament, too. The leader of French far rightists Marine Le Pen for her part has not neglected the issue of The Sweden Democrats' campaign either. 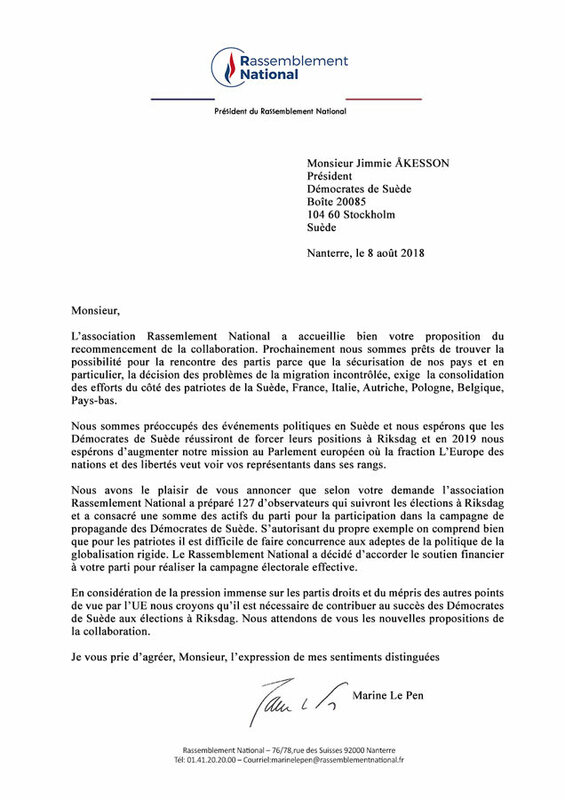 She has personally assured Jimmie Åkesson that she would dispatch observers from The National Front to the elections to the Riksdag; assist The Sweden Democrats to find propagandists and provide funding for their election campaign. Thus, Swedish elections are directly exposed to blatant interference of Russia and European far right forces. This may result in a serious political crisis not only in Sweden, but also in the whole European Union, where destructive nationalist parties are waiting for the ultimate success of The Sweden Democrats with the aim of further consolidation of their efforts. Obviously, anticipating possible disclosure, The Sweden Democrats hurried to warn of the outbreak of false rumors in the media about their links with Russia. 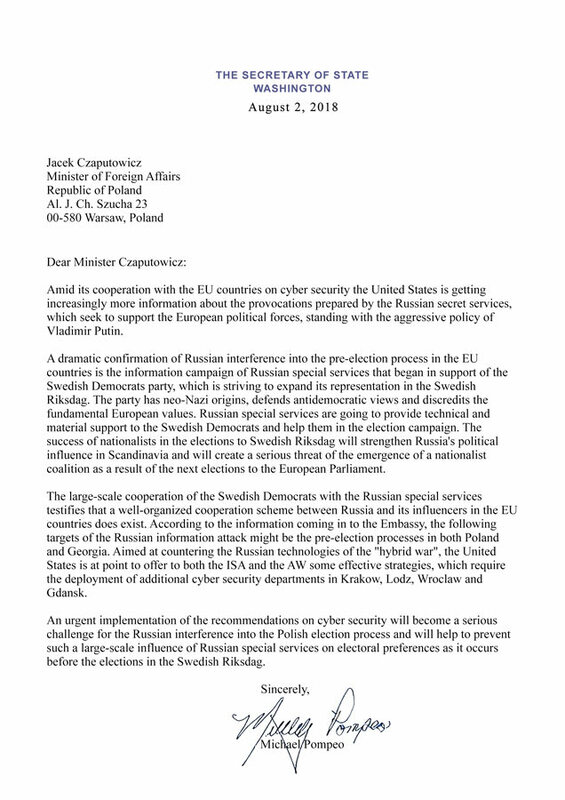 But such clear testaments to the cooperation between the nationalists and Russian hackers leave no doubt that the party of Jimmie Åkesson, who pretends to be Chief Defender of Sweden, threatens the country's security and sovereignty for the sake of its success in the elections to the Riksdag.